Isola claims to have a good snow and sunshine record but if so they're not helped by a depressingly ugly concrete shopping mall/accommodation block as its centre piece. The resort has built more pleasant developments in recent years and endeavoured to improve the original building, linking it all together with a funicular lift. 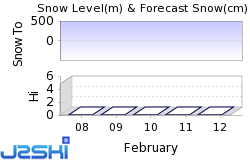 The next notable snow forecast for Isola 2000 is 13cm5in, expected on 4 May. How High is Isola 2000? The French Ski Resort of Isola 2000 has direct access to 120km75 miles of downhill skiing, with 47 marked pistes, served by a total of 24 ski lifts. The ski resort itself is at 2,000m6,562ft, so skiing or boarding back to the resort is usually possible. With ski lifts as high as 2,610m8,563ft, skiing and snowboarding is assured throughout the season. One of the most southerly resorts in Europe and certainly in France, Isola was established in 1971 by English investors. Located on the Italian border, at the edge of the Mercantour Park, most of the original station is one long snaking building, making it possible to access most accommodation, shops, eateries and other facilities without going outside. The name Isola means both 'island' sloping land in two language derivations, whilst 2000 is the usually snowsure height in metres at this latitude. Isola also benefits from Mediterranean climate and a relaxed Italian attitude to life. The resort is a popular weekend destination for residents of the Cote d'Azur who fill the narrow, winding roads up on Friday evenings and Saturday mornings and back on Sunday evenings - best avoided if possible. The Chastillon plateau where Isola is located was a key strategic point in World War II and there are many military remains lying under the snow there today. The modern border which put Isola on the French side was established at the end of the war. An Englishman P Boumphrey had the idea of establishing the ski resort there in the late 1960s as many other third generation French ski stations were being built. He got the support of the local community, particularly the area's mayor who was looking for ways to stop the exodus of local people with the declining availability of work on the land. The longest possible descent in Isola 2000 is 5km3 miles long and the most difficult run is the 'Boumphrey', which is 3km2 miles in length. The convenient ski area fans out above the resort to the south and west right up to the Italian borderline. Beginners benefit from an excellent gentle plateau that stretches for almost five kilometres (three miles) alongside the main resort complex. Both sunshine and snowfall are guaranteed by the resort, which has held the French snowfall record on several occasions. Due to the high altitude, most of the terrain is above the treeline and on sunny slopes. The main route up is via the gondola to Tete de Pelevos directly above the resort. This naturally tends to be the busiest. Some of the toughest runs including black pistes in the Mene and St Sauveur areas are usually quieter. Some of the best intermediate skiing in the Genisserie sector is accessed by one of two high speed quads at the resort. For the most advanced skiers and boarders, of-piste skiing is offered from February by the ski school. Although heli-skiing isn't possible in France, the proximity to Italy means it is also possible to heliski, accessings slopes with at least 1400m verticals, over there with the ski school and its guide-instructors right through into May when conditions are good. Isola 2000 offers good sking, particularly, for Intermediate and Beginner skiers. Isola has a popular snow park, boarder cross and half-pipe. Snowboard shows, live concerts, barbecues and parties are organised here throughout the season. Freestyle and Alpine training sessions are available. Isola has a special place in French snowboarding as the country's first snowboard club, the Back to Back Club, was established here. Affiliated to the AFS (French Snowboard Association), officially recognized by the ministry of Youth and Sports, the Back to Back Club offers a special Snowboard Passport which gives both slope insurance and preferential rates for lift tickets. The Clubhouse contains chill out area, a maintenance workshop, the loan of ARVA devices for off-piste safety, videos broadcasting, a picture library and a library as well as a free Internet access. The Club also has a testing centre for equipment in partnership with the snowboard industry. When is Isola 2000 open? We don't currently have confirmed season dates for Isola 2000. NOTE:- Lift and Piste openings are always subject to Snow Conditions in Isola 2000. Isola 2000 is able to make snow, on 6km4 miles of ski runs, with 403 snow cannons. The 24 ski lifts of Isola 2000 are able to uplift 20,000 skiers and snowboarders every hour. Isola 2000 is in the French Alps in Alpes-Maritimes, Provence-Alpes-Côte d'Azur, France. The nearest airports to Isola 2000 are Nice, Turin Cuneo and Genoa. There are four airports within three hours drive. Most of the resort's bars and cafes are located in the now rather gloomy and tatty indoor arcade. There is however a good selection with more than a dozen bar-eateries inside and another dozen or so dotted around in adjacent buildings. For boarders the Back to Back Club has its own substantial centre, located under the medical centre, with sports room, table tennis table, table football, internet access, library and video games. The two night clubs are La Tanière and Cuba Loca. Other popular Ski Areas near Isola 2000. Common questions about Isola 2000. Want to ask about skiing and snowboarding in Isola 2000? Or contact Isola 2000 Tourist Office. Note :- The information on J2Ski concerning Isola 2000, where not clearly factual, is opinion only and is neither definitive or exhaustive.